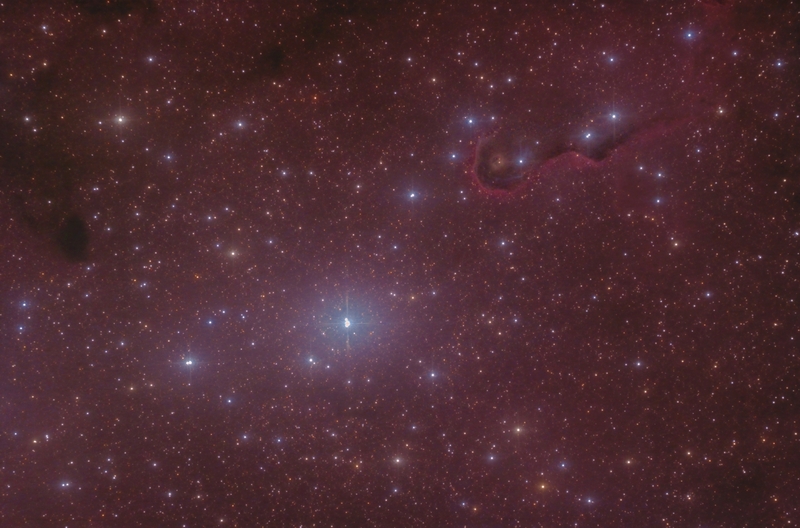 Here is a recent attempt at IC1396, the Elephant Trunk Nebula. This image was taken on a night of so-so transparency, but good seeing. Click on the image to see an earlier attempt with older optics and camera, click again to return to this image. The older image has been rotated an scaled to match the newer shot. The Newtonian I now use does not suffer from astigmatism as did my older SNT, making for tighter stars. My current Canon 60Da has much better Ha response and considerably lower noise as well. Finally I have developed much better processing techniques over the years, resulting in a sharper image with tight stars while maintaining star colour. Processing This image was processed entirely in Images Plus. Calibration, stacking, statistical filter applied to reduce noise before stretching. Masked stretching and split star processing used to enhance the image. Masked noise reduction using a frequency domain low pass filter applied to the DSO layer and then it was recombined with the star layer. Image binned 2 by 2. Final sharpening applied. Since the Canon 60Da has on sensor dark current suppression, no darks and a synthetic bias were used in the calibration. Details on the older image can be found here.